Trim defeated Ballinlough in the final round of the group stage of the intermediate championship in Marty on Sunday afternoon. This was a top of the table clash; the town team finish top of the group leaving the Lough in second place. There was a nervy start to the match as both sides notched up a few wides before Trim finally registered a point from play quickly followed with a score from a free. Colm Mallen then completed a fine move, which he started, with a good point. Michael Lowther drove over a good score from distance to put two between the sides again; 0-3 to 0-1. Cian Mallen then got Ballinlough back within a point after a good run. The teams traded scores before the short whistle, with ‘The Lough’s’ score coming from a Peadar Byrne free to leave the Trim leading by the minimum; 0-4 to 0-3. Ballinlough got the second half off to the best possible start notching a goal and a point within 3 minutes of the restart. After a flowing Ballinlough move Tommy McCullen got on the end of a high speculative Colm Mallon effort to palm the ball to the back of the net, it was immediately followed with another Colm Mallon point which put them ahead 1-4 to 0-4. Trim then landed their opening score of the second half and this was shortly followed by a well worked Neil Heffernan goal before Ronan McGuinness pointed for Ballinlough levelling the score. This proved to be the last time the sides were level as Trim began to find their scoring boots; two well taken points for the town team were followed with a James Toher goal, this short period of dominance proved to be crucial. 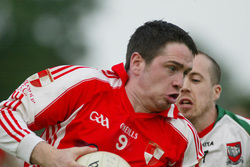 Peadar Byrne did convert three scores from placed balls in the last 10 minutes of the game but these were interjected with two Trim points to keep the fight-back at bay. Ballinlough created goal scoring chances in the closing period, but a combination of wayward shooting and excellent defending meant they couldn’t find a way past Brendan Murphy. Best for the Lough, in a lacklustre display, were Colm Mallon, Kevin Devine, Benji Smith and Cian Mallon. The result means Trim go through to meet Na Fianna in a semi final while the Lough must focus on a quarter final tussle with Castletown. Ballinlough: K. McGuinnes, B Smith, P. Muldoon, R. Farrell, M. Geraghty, K. Devine, Colm Mallen, Cian Mallen, P. Byrne, T. McCullen, R. McGuinnes, G. Reilly, K. Mallen, M. McCullen, K. Rothwell. Subs: S. Deevy for McCullen, J. O’Reilly for K. Mallen and J. O’Higgins for T. McCullen.